Gordon Moody Association is a unique service that offers residential treatment in the UK for problem gamblers. If a drug addict steals money from their mother's purse, to buy drugs with, they know it is a one-way street, the money is gone and will be missed; if a drug addict takes the day's takings from their place of work, they know they will never be able to replace it. However addicted gamblers, having stolen money and lost it, will persuade themselves that they need to steal again in order to win back their losses so as to replace the money they stole. It is self delusion, but allows an addicted gambler to go far further in the abuse of the trust of others than substance-based addicts are normally able, or willing, to. You can read testimonials from a couple of satisfied customers, and make a donation if you want to support their work. Gamblock is a download software utility which blocks access to online gambling sites and software, forcibly restricting the problem gambler's access to potentially damaging activity. GamBlock searches the data in each site requested for viewing on the internet. On receiving the data it checks to see if this is a site which has gambling, wagering or betting facilities. Following a number of sophisticated analyses it advises the user if this is a site to which access will not be permitted. On detection of a gambling site the browser is shut down and a warning message is displayed. GamBlock also blocks non-browser based online gambling activities and can be configured to hide its operation from guests. GamBlock has done extensive research on the type and number of internet sites offering gambling facilities. On the basis of this research we are able to determine the type and nature of gambling sites through sophisticated diagnostic methods. You can choose which version of the software you require from the download page. The personal licence is most appropriate for domestic use, costing $89 (about £60). There's also a mobile phone version, which, logically enough, must be purchased from, and downloaded to, the phone in question. I can tell you in no uncertain terms that this product has changed my life. I lost more money than I could afford to lose whilst playing online poker - I was absolutely hooked. My own home was not a 'safe' place to be whilst I had a computer with access to gambling sites. My relationships were wrecked, I didnt sleep properly, I was decietful and preoccupied with the next gambling binge. Assuming all the testimonials are genuine, it looks like this product does its job pretty well. Since this is something I've barely touched on, I thought a series of articles on the various help organisations available for gambling problems would be useful. I'll kick off with Gamcare. • An online counselling service, "netline", operational between 8am and midnight. • A discussion forum where you can share problems in public and receive feedback. There is an online gambling help section, where you can download their remote gambling guide, which offers possible solutions to online gambling problems and a few stories from people who have had problems, as well as advice about protecting children from online gambling. There is also a self-help guide, worth a look in conjunction with the one-to-one services on offer. It lists various possible indicators and consequences of gambling addiction, and offers suggestions on how to go about tackling the problem. Gamcare Trade Services is a wholly-owned subsidiary of Gamcare, whose job it is to provide certification for both terrestrial and online companies who adhere to the charity's objectives. This is beneficial to both casinos and punters, as operators are shown to be responsible and the customers should feel safe in the hands of people whose practices have been given a clean bill of health. GTS is a commercial operation, and the profits go towards the costs of maintaining the Gamcare counselling service. 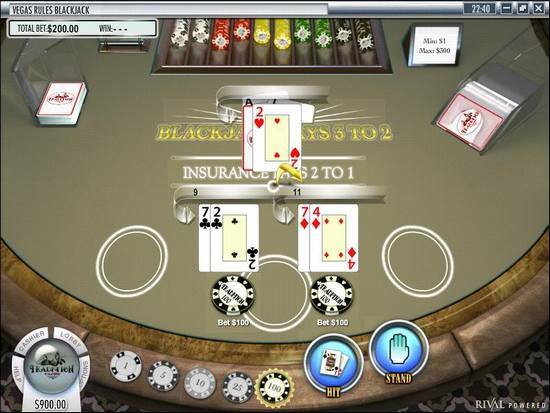 For clarity an individual bet relates to the total amount wagered on one spin of the roulette wheel, one individual hand against the house in table games or blackjack (double up in any individual hand is permitted), one deal of the cards in video poker (no matter how many hands are chosen to play with) and one spin of slots. Intercasino clearly - and correctly - considers that the blackjack double down wager doesn't infringe their betsize limitations with regard to bonuses. On the other hand, on the basis of the situation discussed in the above article, it's evident that they view the video poker double up feature in a different light. So how is double down in blackjack different to double up in video poker? It might be useful to recap the logistics of the two bets to get a better idea. After the deal of the initial two cards to both player and dealer, the player is presented with a series of options. The only circumstance in which the player is given no option at all is in the case of an ace and a ten, a natural 21 which cannot be improved or beaten. Aside from that, the hand is always considered incomplete until the player has made at least one more play decision. One such option is the double down bet, an extra wager which results in the receipt of one more card to the player hand. Once the player has made his decision / decisions, his hand is complete. At this point, play turns to the dealer's hand, and the round is concluded. As such, it is noted that the double down bet is an integral part of the round of play - the hand is never considered complete until the option is accepted, or rejected on the basis of either another option being taken or there simply not being a double down option available in the first place. While the double down option is live, the hand is incomplete. The player receives five cards. He then has the option of discarding any of the cards he wishes. Discarded cards are replaced, and if a winning combination has been achieved it is paid as appropriate. The hand is now complete. 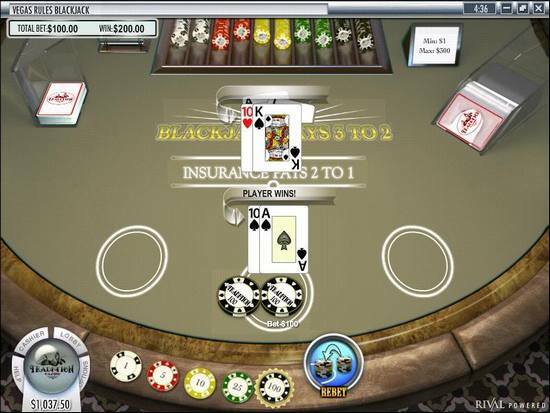 If the player has achieved a winning hand, he is offered the double up option. If he accepts it, one more card is dealt to both player and dealer. If the player's card is higher, he wins the double. If the dealer's is higher, the winnings are lost. Crucially, the video poker double up bet is not an integral part of the main wager, but a separate bet altogether. It has no relation whatsoever to the base video poker game, the only connection being that the winnings from the base game are used to make the wager. In fact, the double up game could exist in its own right, without being offered as an optional extra to another game. Equally, it could be attached to non-video poker games - roulette, baccarat or any other. In summary: the blackjack double down is an integral part of the round of play, whose acceptance or rejection has an effect on the outcome of the wager; the video poker double up is a non-integral, distinct bet whose acceptance or rejection has no bearing on the outcome of the main wager. Returning then to the rules I quoted at the top and the adherent discussion, it would appear reasonable to put restrictions on the video poker double up when a bonus is in play, as it is as separate and distinct a wager as the initial wager on the VP game, and can reasonably be ruled as governed by the same "percentage of bonus" rules that govern the initial bet. It is with our great reluctance to inform you that following a review of your account activity, your account has been identified as one that has displayed certain activity we feel is not in the spirit of promotions. As a result your account has been and will remain disabled, thank you for your understanding in this matter. Intercasino has a rule that you can't place bets over 25% of the bonus, so if the bonus is 125£, betting 25£ on Video Poker should be fine. They don't have a rule against the double up feature, but when I doubled up winning amounts over 25£, they said that I've violated the rule of not betting over 25% of the bonus. I think that using the double-up feature is a part of the initial bet and not a new bet. 32red.com has exactly the same rules and they paid me without a problem. InterCasino reserves the right to refuse withdrawals and lock all accounts of players found abusing this rule. It's encouraging to note that Intercasino clearly states that use of the double down feature in blackjack is not considered a violation of the maximum bet rule. This really should not require any clarification, but it has been known to cause confusion and it's good to see the point made. The rules do not make this clarification for video poker - they just mention "one deal of the cards" being permitted, not that the subsequent double up function is also allowed, as with blackjack. They should specify this, but given the blackjack clarification you could reasonably conclude that the lack of mention of the double up equates to its ineligibility, assuming the combined total exceeds the stated 25% limit. My own take on the issue is that the Intercasino rules are reasonably clear, if not perfectly so, and they have a defensible case in revoking these winnings. 1) They should specifically state that the video poker double up will be included in the total initial wager size calculation, and if the combined total of initial bet plus any doubles exceeds 25% of the bonus, this is grounds for confiscation of winnings. Your account has been identified as one that has displayed certain activity we feel is not in the spirit of promotions. Since Intercasino has a reasonable case here in claiming rules violation, they should just say so, giving the player an exact explanation. When casinos talk about the "spirit of the promotion", you can be sure such amateurish and vague nensensical waffle is a result of a very unsure position on their part. I would have thought a Brit would be able to apply a "common law" approach to this issue. I cannot see how you could take the position that InterCasino's theft of the winnings is defensible - when you take into account their own contradiction in their position on BJ doubling, as well as 32Red's position on the issue, as well as common sense. Yet I don't have any issue with their use of language when notifying players they are no longer offering them exploitability. Actually, I've firmed up my opinion after more fully mulling over the matter - see my blackjack / VP post. On this occasion, Intercasino was entitled to make this call, as the double bet is entirely separate, and therefore governed by the same percentage of betsize restrictions as the initial wager. It would be helpful if the specified this fully in the terms, however. Even if VP double up is considered as a separate wager, what if you enter the double up game with a winning size that doesn't break the max. 25% of bonus bet rule? For example you could only double up winnings that result from a high pair (a push payout). Would you consider each additional doubling up as a separate bet or just the first one? If the double bet doesn't break the 25% rule, then you should be fine. Say, £125 bonus and you're playing £1 single line, £5 total bet. You hit a flush for £30. You can double no problem, as the restriction is £31.25. Of course, you can't go on to double again, as that'd be £60, which is over the limit. As long as you stay within the 25% restriction for any double bet, you're good to go. [QUOTE]Say, £125 bonus and you're playing £1 single line, £5 total bet. You hit a flush for £30. You can double no problem, as the restriction is £31.25. But if you enter the double up game with a 30£ win which is below the allowed maximum, shouldn't you be allowed to double up as many times as you want after that, since surely each doubling up doesn't count as a completely different wager but just the first one? Each game is separate, the same as a round of blackjack, roulette or whatever else. As such, whatever the percentage restriction is, it will apply to each bet. So, your £30 would be OK, but another double up, on £60, wouldn't be. [QUOTE]Each game is separate, the same as a round of blackjack, roulette or whatever else. As such, whatever the percentage restriction is, it will apply to each bet. Is that just your interpretation or is there some good reason to support this? If we ignore the VP game and assume that the doubling up game is offered as a standalone game if I put a 10£ wager on the game it counts as 10£ wager no matter how many times I double up until the round ends. Similarily if you play any Hi-Lo game, no matter how many consecutive rounds you play through, only the initial wager which you take to the game at the beginning counts as wager. The wager in a standalone version of this game would still be governed by bonus rules, assuming a bonus was in the mix. If it was a "wild doubling" game, then the restriction would be bizarre, but still there. Of course, with a zero house edge, the doubling game wouldn't be available for bonus play in the first place. In terms of my opinion or otherwise, I'm basing it on the casino's response and my own reasoning thereof. I've added a Tradition Casino warning to my rogue page. The casino claimed that payouts were changed in error during a period of new staff training, suggesting that the casino itself, as opposed to the software supplier, can change such fundamental standards on a whim. Paying blackjacks at even-money adds approximately 2.4% to the house edge, depending on the number of decks in play. Loss of the double after split option adds around 0.14%. So, in total an average 0.5% house edge for perfect play blackjack would increase five-fold in these circumstances to 3%, with the payout reduced from 99.5% to 97%. It's not clear to me exactly what happened here that resulted in the short-paying blackjack and the double after split discrepancy. The reason given about employee training isn't especially credible. My directory page has a list of Rival casinos which is not fully comprehensive, but which should give you an idea of most of the other casinos which may share this ability to alter crucial game payments and reconfigure the rules. My recommendation is to avoid Rival casinos. These spots are so tricky. Does one avoid them like they are going out of fashion? Or pile in as if it's a fire sale? Rogue + Stupidity = Standard. Avoid. Rogue no Stupidity = Run! No Rogue no Stupidity = ugh. 32Red blech professionalism. It's probably not a bad habit to get into were you to make a point of attributing screenshots correctly to their owner/s. I'm really just nit-picking though. Of course I don't really mind. It seems the answer to my musing above was "avoid like they are going out of fashion". I'm hearing reports Rival is all-but-donkdown. The Be The Dealer group may have problems, according to a Be The Dealer warning posted at the GPWA. Of the other sites I've checked, they still exist, but the download pages are missing, and they are all very slow to load - 777 Dealer is one such example. Assuming signing up is even possible, which it does not appear to be, this may be one to steer clear of. The standards set by eCOGRA for their operator partners are laid out in the generally accepted practices document, or "EGAP". As with most things aboard the Good Ship Spin of the online gambling industry, it walks the walk and talks the talk rather well. But how far are they applied? For this article, I'm going to focus on an area close to my heart - promotions and bonuses. Advertising media and content as well as promotional activities shall comply with the letter and spirit of eCOGRA. Terms and conditions applicable to promotional activities shall be clearly displayed and shall not be unreasonably altered subsequent to the wagering activity. The first is vague in the extreme, the second more specific. The "spirit of eCOGRA" must relate to the claims on the homepage of "particular emphasis on fair and responsible gambling", with their certification being "synonymous with the highest industry levels of fair and responsible gaming, professional conduct and superior operating standards." So the EGAP implementation of rules 113 R1 and R4, on the part of the client casinos, has a lot to live up to. i.Placing single bets equal to or in excess of 25% or more of the value of the bonus credited to the account prior to the play-through requirement for that bonus having been met. I wrote about this at length in my Kahnawake article, but to cut a long story short: the Kahnawake Commission required that, aside from making the appropriate payment, the casino place their terms in an accessible position - clearly, spread across two pages was unacceptable and deceptive. The casino never complied with this directive. Is the placement of vital bonus terms and conditions on pages where the player would never expect to find them in any way "synonymous with the highest industry levels of fair and responsible gaming, professional conduct and superior operating standards" as per the lofty requirements of EGAP clause 113R. 1? Are these terms "clearly displayed", as per 113R. 4? Clearly, the answer is negative on both counts. There are many such examples of unethical, unacceptable rules across many other eCOGRA certified casinos, and I highlighted a few more examples in the Online gambling rules article. There are many more. As such, eCOGRA does seem to talk a good game in its EGAP document, but a relatively superficial analysis of the rules, terms and conditions on a handful of their clients casinos' sites reveals either a policing which is non-existent, or a reality which is far, far removed from the marketing hype. So are there any eCOGRA casinos which comply with "the letter and spirit of eCOGRA"? Well, yes. They all do. With relatively few exceptions, they comply with the letter and spirit of eCOGRA to the...letter. Isn't that backwards? Surely most do no such thing? The only "letter and spirit" that holds any meaning for operators in the online gambling industry is the "letter and spirit" that results in the transference of as much money as possible from the customers into the operators' pockets. eCOGRA is no different. So yes, the eCOGRA client operators comply with eCOGRA's ideals, aims and objectives to the letter. It's just a pity that the true "letter and spirit" is so radically different to the one we read about in the marketing brouchure. The Gambling Commission (the Commission) undertakes a rolling programme of nationwide test purchase visits to determine that adequate and effective controls are in place to prevent under age gambling. The Commission benefitted on this occasion from working with a number of local council licensing authorities on the most recent series of visits to betting shops. While the results show that there is still plenty of work to be done, the five major betting operators in Great Britain, accounting for around 80% of betting shops, have made considerable progress. Following disturbing results in May this year when almost all shops failed a similar exercise, these results show that in 65% of the 160shops visited, a person under 18 years of age was prevented from placing a bet at the counter. This exercise also covered initial visits to a small sample of those medium and smaller betting operators in England and Wales that make up 20% of the total number of betting shops. The results were poor with only 35% of betting shops visited preventing someone under age from betting at the counter. So, Ladbrokes scored three out of four, but it was all downhill from there, with Coral's detection rate at just over a half and the minnows managing just one in three. How hard is it to ask to see a youngster's ID? That's an impressive claim: not only is this organisation independent, but it is unique, the only one of its kind, somehow appointed by "the online gambling industry" to alone fly the flag of standards, integrity and fairness. Independent Directors are solely responsible for determining which software developers are admitted as eCOGRA members, and which operators qualify for the eCOGRA Seal. Actually, the claim for independence and uniqueness crumbles away at the most cursory examination. All decisions regarding how casinos and poker rooms are tested and who gets the Seals fall under the control of the four independent directors on the Board. This is clearly set out in the company's constitution. These are all eminent and well-qualified and experienced professional men. Most important of all - they are all independent of the funding entities. Who are these funding entities? It's mentioned nowhere on the site - and maybe this isn't so surprising. The funding entities of eCOGRA are those same software companies whose casinos eCOGRA signs off as "safe and fair". It really makes no difference whether the decision making comes from industry insiders, Donald Duck or The Flintstones. You cannot be independent as an overseer / regulator while your salaries come from those same entities you regulate. But does it work, warts and all? If it does work, then it really matters little where the funding comes from. In 2006, the Jackpot Factory Microgaming casino group ran one of the most ethically-challenged marketing campaigns ever seen, in which they targetted the old, bereaved and terminally ill - you can read blow-by-blow reports on this in the Winneronline and Casinomeister dicussions. The Foundation for Arthritis Prevention has recently announced that certain games can help reduce the worsening and spread of arthritis. The Foundation also announced that it encourages the elderly to play multi-line slots and the other games listed because this will help not only improve the condition of those people with arthritis, but multi-line slots might even help prevent the occurrence of arthritis in later life. The Foundation stated that multi-line slots was not a game which was too confusing and that the elderly would be able to pick it up quite easily without major hassles. There were many other such examples. Their actions were roundly condemned, and the eCOGRA seals were removed. The independent directors carried out an investigation. This turned out to be little more than a whitewash, and the Jackpot Factory "play it safe" seals were back up very quickly - you can read my eCOGRA and Jackpot Factory article for full details on their report. Just once were the eCOGRA independent directors called upon to act. And just once they failed. In fairness, even those regulatory entities which are theoretically impartial, governmental bodies such as the Malta LGA or the Aldeney AGCC, have been found seriously wanting in the player protection department. But crucially, the funding of those bodies does not come from the gambling operations they license. The casinos pay a fee, but the regulators themselves are publically funded, which gives them at least a degree of theoretical autonomy. So: is eCOGRA "the independent standards authority of the online gambling industry"? At least, not by my understanding of the word "independent". Interesting points , I will how ever add that micro gaming defy probable outcome in there poker room and E Cogra fail to show any test results after many requests. Alderney gaming commission who regulate LOL JOKE poker stars also fail to close a loop hole in there regs that allows manipulation of expected outcome. The whole online poker industry runs free from ant serious regulation and cheats there deals to create action any way they please. Do not be fooled online poker is rigged. I've updated my rogue casinos page to include a warning against Slots Oasis Casino. Since the two sister casinos, Rushmore and Cherry Red, already figure in my rogue listing, it may not be entirely surprising that Slots Oasis now has dishonourable mention. HR 2267 is the legislation proposed by US senator Barney Frank for the regulation of online gambling in the USA. You can use the contents links below to navigate to the various sections, which should facilitate the reading of this large document. (1) APPLICANT - The term 'applicant' means any person who has applied for a license pursuant to this subchapter. (2) BET OR WAGER - The term 'bet or wager' has the same meaning as in section 5362(1). (3) ENFORCEMENT AGENT - The term 'enforcement agent' means any individual authorized by the Secretary to enforce the provisions of this subchapter and regulations prescribed under this subchapter. (4) INDIAN LANDS AND INDIAN TRIBE - The terms 'Indian lands' and 'Indian tribe' have the same meanings as in section 4 of the Indian Gaming Regulatory Act. (5) INTERNET - The term 'internet' has the same meaning as in section 5362(5). (6) LICENSEE - The term 'licensee' means an entity authorized to operate an Internet gambling facility in accordance with this subchapter. (7) OPERATE AN INTERNET GAMBLING FACILITY - The term 'operate an internet gambling facility' or 'operation of an Internet gambling facility' means the direction, management, supervision, or control of an internet site through which bets or wagers are initiated, received, or otherwise made, whether by telephone, Internet, satellite, or other wire or wireless communication. (8) SECRETARY - The term 'secretary' means the Secretary of the Treasury, or any person designated by the Secretary. (9) STATE - The term 'state' means any state of the United States, the District of Columbia, or any commonwealth, territory, or other possession of the United States. (10) SPORTING EVENT - The term 'sporting event' means any athletic competition, whether professional, scholastic, or amateur. (1) LICENSING REQUIRED FOR CERTAIN INTERNET GAMBLING - No person may operate an Internet gambling facility that knowingly accepts bets or wagers from persons located in the United States without a license issued by the Secretary in accordance with this subchapter. (2) AUTHORITY UNDER VALID LICENSE - A licensee may accept bets or wagers from persons located in the United States, subject to the limitations set forth in this subchapter, so long as its license remains in good standing. (1) IN GENERAL - Any person seeking authority to operate an internet gambling facility offering services to persons in the United States may apply for a license issued by the Secretary. (A) IN GENERAL - No person shall be eligible to obtain a license unless the Secretary has determined, upon completion of a background check and investigation, that the applicant, and any person deemed to be in control of the applicant, is suitable for licensing. (B) ASSOCIATES OF APPLICANTS - If the applicant is a corporation, partnership, or other business entity, a background check and investigation shall occur with respect to the president or other chief executive of the corporation, partnership, or other business entity and other partners or senior executives and directors of the corporation, partnership, or entity, as determined appropriate by the Secretary, in the Secretary's sole discretion. (C) BACKGROUND CHECK AND INVESTIGATION - The Secretary shall establish standards and procedures for conducting background checks and investigations for purposes of this subsection. (4) ONGOING REQUIREMENT - A licensee (and any other person who is required to be determined to be suitable for licensing in connection with such licensee) shall meet the standards necessary to be suitable for licensing throughout the term of the license. (5) PROTECTION OF THE PUBLIC TRUST - The Secretary may take such action as is necessary to protect the public trust, including the implementation of such safeguards as may be necessary to ensure the operation of an internet gambling facility licensed under this subchapter is controlled only by persons who are suitable for licensing. (A) DETERMINATION OF UNSUITABILITY FOR CONTINUED LICENSURE - If the Secretary finds that an individual owner or holder of a security of a licensee, or of a holding or intermediary company of a licensee or any person with an economic interest in a licensee or a director, partner, or officer of a licensee is not suitable for licensing, the Secretary may determine that the licensee is not qualified to continue as a licensee. (B) ACTION TO PROTECT THE PUBLIC INTEREST, INCLUDING SUSPENSION - If the Secretary may determine that the licensee is not qualified to continue as a licensee, the Secretary shall propose action necessary to protect the public interest, including, if deemed necessary, the suspension of the licensee. (A) IN GENERAL - The cost of administering this subchapter with respect to each licensee, including the cost of any review or examination of a licensee to ensure compliance with the terms of the license and this subchapter, shall be assessed by the Secretary against the licensee institution by written notice in an amount appropriate to meet the Secretary’s expenses in carrying out such administration, review, or examination. (C) HEARING - Any licensee against whom an assessment is assessed under this paragraph shall be afforded an agency hearing if such person submits a request for such hearing within 20 days after the issuance of the notice of assessment. (i) REFERRAL - If any licensee fails to pay an assessment under this paragraph after the assessment has become final, the Secretary shall recover the amount assessed by action in the appropriate United States district court. (ii) APPROPRIATENESS OF ASSESSMENT NOT REVIEWABLE - In any civil action under clause (i), the validity and appropriateness of the assessment shall not be subject to review. (2) DIRECT AND EXCLUSIVE OBLIGATION OF LICENSEE - The user fee shall be the direct and exclusive obligation of the licensee and may not be deducted from amounts available as deposits to any person placing a bet. (f) Approval of License - The Secretary shall grant licenses under this subchapter if the applicant meets the criteria set by the Secretary set forth in this subchapter and in any regulations promulgated thereunder. (1) LEGAL AGE - Appropriate safeguards to ensure that the individual placing a bet or wager is of legal age as defined by the law of the State or tribal area in which the individual is located at the time the bet or wager is placed. (2) PERMISSIBLE LOCATION - Appropriate safeguards to ensure that the individual placing a bet or wager is physically located in a jurisdiction that permits Internet gambling at the time the bet or wager is placed. (3) COLLECTION OF CUSTOMER TAXES - Appropriate mechanisms to ensure that all taxes relating to internet gambling from persons engaged in internet gambling are collected at the time of any payment of any proceeds of internet gambling. (4) COLLECTION OF TAXES OF LICENSEE - Appropriate mechanisms to ensure that all taxes relating to internet gambling from any licensee are collected and disbursed as required by law, and that adequate records to enable later audit or verification are maintained. (5) SAFEGUARDS AGAINST FINANCIAL CRIME - Appropriate safeguards to combat fraud, money laundering, and terrorist finance. (6) SAFEGUARDS AGAINST COMPULSIVE GAMBLING - Appropriate safeguards to combat compulsive Internet gambling. (7) PRIVACY SAFEGUARDS - Appropriate safeguards to protect the privacy and security of any person engaged in Internet gambling. (8) PAYMENT OF ASSESSMENTS - Appropriate mechanisms to ensure that any assessment under subsection (e) is paid to the Secretary. (9) OTHER REQUIREMENTS - Such other requirements as the Secretary may establish by regulation or order. (1) TERM - Any license issued under this section shall be issued for a 5-year term beginning on the date of issuance. (2) RENEWAL - Licenses may be renewed in accordance with the requirements prescribed by the Secretary pursuant to this subchapter. (2) FINAL ACTION - Any revocation of a license under paragraph (1) shall be treated as a final action by the Secretary. (A) PRODUCTION AT DESIGNATED SITE - A summons issued pursuant to this subsection may require that books, papers, records, or other data stored or maintained at any place be produced at any business location of a licensee or applicant for a license or any designated location in any State or in any territory or other place subject to the jurisdiction of the United States not more than 500 miles distant from any place where the licensee or applicant for a license operates or conducts business in the United States. (B) NO LIABILITY FOR EXPENSES - The United States shall not be liable for any expense incurred in connection with the production of books, papers, records, or other data under this subsection. (C) SERVICE OF SUMMONS - Service of a summons issued under this subsection may be by registered mail or in such other manner calculated to give actual notice as the Secretary may prescribe by regulation. (A) REFERRAL TO ATTORNEY GENERAL - In case of contumacy by a person issued a summons under this subsection or a refusal by such person to obey such summons or to allow the Secretary to conduct an examination, the Secretary shall refer the matter to the Secretary of the Treasury for referral to the Attorney General. (C) COURT ORDER - The court may issue an order requiring the person summoned to appear before the Secretary or a delegate of the Secretary to produce books, papers, records, and other data, to give testimony as may be necessary to explain how such material was compiled and maintained, to allow the Secretary to examine the business of a licensee, and to pay the costs of the proceeding. (D) FAILURE TO COMPLY WITH ORDER - Any failure to obey the order of the court may be punished by the court as a contempt thereof. (E) SERVICE OF PROCESS - All process in any case under this subsection may be served in any judicial district in which such person may be found. (A) WRITTEN NOTICE - Any penalty imposed under paragraph (1) may be assessed and collected by the Secretary by written notice. (B) FINALITY OF ASSESSMENT - If, with respect to any assessment under paragraph (1), a hearing is not requested pursuant to subparagraph (E) within the period of time allowed under such subparagraph, the assessment shall constitute a final and unappealable order. (C) AUTHORITY TO MODIFY OR REMIT PENALTY - The Secretary may compromise, modify, or remit any penalty which the Secretary may assess or has already assessed under paragraph (1). (E) HEARING - The person against whom any penalty is assessed under paragraph (1) shall be afforded an agency hearing if such person submits a request for such hearing within 20 days after the issuance of the notice of assessment. (i) REFERRAL - If any person fails to pay an assessment after any penalty assessed under this paragraph has become final, the Secretary shall recover the amount assessed by action in the appropriate United States district court. (ii) APPROPRIATENESS OF PENALTY NOT REVIEWABLE - In any civil action under clause (i), the validity and appropriateness of the penalty shall not be subject to review. (G) DISBURSEMENT - All penalties collected under authority of this subsection shall be deposited into the Treasury. (3) CONDITION FOR LICENSURE - Payment by a licensee of any civil penalty assessed under this subsection that has become final shall be a requirement for the retention of its license. (m) Treatment of Records - In light of business competition, confidentiality, and privacy concerns, the Secretary shall protect from disclosure information submitted in support of a license application under this subchapter and information collected in the course of regulating licensees to the full extent permitted by sections 552 and 552a of title 5, United States Code. (1) IN GENERAL - Any person that knowingly manages, administers, or controls bets or wagers that are initiated, received, or otherwise made within the United States or that otherwise manages or administers the games with which such bets or wagers are associated must meet all of the suitability for licensing criteria established under this section in the same manner and to the same extent as if that person were itself a licensee. (2) SUBJECT TO SAME ENFORCEMENT JURISDICTION - Any failure on the part of such person to remain suitable for licensing shall be grounds for revocation of the license of the licensee for whom such service is provided, in the same manner and in accordance with subsection (i). (3) RELIANCE ON STATE OR TRIBAL CERTIFICATION - Any applicant may provide a certification of suitability for licensing made by any State or tribal regulatory body under paragraph (2), together with all documentation the applicant has submitted to any such State or tribal regulatory body, to the Secretary, and any such certification and documentation shall be relied on by the Secretary as evidence that an applicant has met the suitability for licensing requirements under this section. (4) AUTHORITY OF SECRETARY TO REVIEW - Notwithstanding any certification of suitability for licensing made by any State or tribal regulatory body, the Secretary retains the authority to review, withhold, or revoke any license if the Secretary has reason to believe that any applicant or licensee does not meet the suitability requirements for licensing established under this section, or any other requirement of a licensee. (5) RELIANCE ON QUALIFIED REGULATORY BODY FOR OTHER PURPOSES - At the discretion of the Secretary, the Secretary may rely on any State and tribal regulatory body found qualified under this subsection for such other regulatory and enforcement activities as the Secretary finds to be useful and appropriate to carry out the purposes of this subchapter. (6) REVOCATION OF QUALIFICATION - The Secretary may revoke, at any time and for any reason, the qualification of any State or tribal regulatory body to certify or to conduct any other regulatory or enforcement activity to carry out the purposes of this subchapter. (a) Regulations Required - The Secretary and any state or tribal regulatory body that has been qualified under subsection 5383(o) shall prescribe regulations for the development of a problem gambling, responsible gambling, and self-exclusion program on the basis of standards that each licensee shall implement as a condition of licensure. (A) IN GENERAL - The Secretary shall provide by regulation for the establishment of a list of persons self-excluded from gambling activities at all licensee sites. (2) PLACEMENT AND REMOVAL PROCEDURES - The regulations prescribed by the Secretary under paragraph (1)(A) shall establish procedures for placements on, and removals from, the list of self-excluded persons. (B) RULE OF CONSTRUCTION - No provision of subparagraph (A) shall be construed as preventing the Director from assessing any regulatory sanction against a licensee for failing to comply with the minimum standards prescribed pursuant to this subsection. (A) IN GENERAL - Notwithstanding any other provision of federal or state law, the list of self-excluded persons shall not be open to public inspection. (B) AFFILIATE DISCLOSURE - Any licensees may disclose the identities of persons on the self-excluded list to any affiliated company or, where required to comply with this subsection, any service provider, to the extent that the licensee ensures that any affiliated company or service provider maintains such information under confidentiality provisions comparable to those in this subsection. (5) LIMITATION ON LIABILITY FOR DISCLOSURE - A licensee or an employee, agent, or affiliate of a licensee shall not be liable to any self-excluded person or to any other party in any judicial proceeding for any harm, monetary or otherwise, which may arise as a result of disclosure or publication in any manner. (1) PROHIBITION BENEFITTING FROM PROHIBITED GAMBLING ACTIVITY - A person who is prohibited from gambling with a licensee by law, or by order of the Secretary or any court of competent jurisdiction, including any person on the self-exclusion list as established in accordance with subsection (c), shall not collect, in any manner or proceeding, any winnings or recover any losses arising as a result of any prohibited gambling activity. (2) FORFEITURE - In addition to any other penalty provided by law, any money or thing of value that has been obtained by, or is owed to, any prohibited person by a licensee as a result of bets or wagers made by a prohibited person shall be subject to forfeiture by order of the Secretary, following notice to the prohibited person and opportunity to be heard. (3) DEPOSIT OF FORFEITED FUNDS - Any funds forfeited pursuant to this subsection shall be deposited into the general fund of the Treasury. (A) IN GENERAL - The Secretary and any State or tribal regulatory body that has been qualified under subsection 5383(o) shall provide by regulation for the establishment of a program to alert the public to the existence, consequences, and availability of the self-exclusion list, and shall prepare and promulgate written materials to be used in such a program. (B) LICENSEE-PROVIDED PUBLICITY - Regulations prescribed under subparagraph (A) may require a licensee to make available literature or screen displays relating to the existence of the program. (2) RULE OF CONSTRUCTION - No provision of this subsection shall be construed as creating a legal duty in the Secretary, a qualified State or tribal regulatory body, a licensee, or any representative of a licensee to identify or to exclude problem or compulsive gamblers not on the list of self-excluded persons. (3) IMMUNITY - The United States, the Secretary, a qualified State or tribal regulatory body, a licensee, and any employee or agent of a licensee, shall not be liable to any person in any proceeding for losses or other damages of any kind arising out of that person's gambling activities based on a claim that the person was a compulsive, problem, or pathological gambler. (a) In General - No financial transaction provider shall be held liable for engaging in financial activities and transactions for or on behalf of a licensee or involving a licensee, including payments processing activities, if such activities are performed in compliance with this subchapter and with applicable Federal and State laws. (A) CREDIT, CREDITOR, CREDIT CARD, AND CARD ISSUER - The terms 'credit', 'creditor', 'credit card', and 'card issuer' have the meanings given the terms in section 103 of the Truth in Lending Act. (C) FINANCIAL INSTITUTION - The term 'financial institution' has the meaning given the term in section 903 of the Electronic Fund Transfer Act, except that such term does not include a casino, sports book, or other business at or through which bets or wagers may be placed or received. (E) MONEY TRANSMITTING BUSINESS AND MONEY TRANSMITTING SERVICE - The terms'money transmitting business' and 'money transmitting service' have the meanings given the terms in section 5330(d) (determined without regard to any regulations prescribed by the Secretary under such section). (A) IN GENERAL - No licensee may engage, under any license issued under this subchapter, in the operation of an internet gambling facility that knowingly accepts bets or wagers initiated by persons who reside in any State which provides notice that it will limit such bets or wagers, if the Governor or other chief executive officer of such State informs the Director of such limitation, in a manner which clearly identifies the nature and extent of such limitation, before the end of the 90-day period beginning on the date of the enactment of the Internet Gambling Regulation, Consumer Protection, and Enforcement Act, or in accordance with paragraph (2), until such time as any notice of any amendment or repeal of such specific limitation becomes effective under paragraph (2). (C) COORDINATION WITH INDIAN GAMING REGULATORY ACT - No decision by a State under this subsection shall be considered in making any determination with regard to the ability of an Indian tribe to offer any class of gambling activity pursuant to section 11 of the Indian Gaming Regulatory Act. (1) LIMITATIONS IMPOSED BY INDIAN TRIBES - No internet gambling licensee knowingly may accept a bet or wager from a person located in the tribal lands of any Indian tribe which limits such gambling activities or other contests if the principal chief or other chief executive officer of such Indian tribe informs the Secretary of such limitation, in a manner which clearly identifies the nature and extent of such limitation, before the end of the 90-day period beginning on the date of the enactment of the Internet Gambling Regulation, Consumer Protection, and Enforcement Act, or in accordance with paragraph (2), until such time as any notice of any amendment or repeal of such specific limitation becomes effective under paragraph (2). (2) COMPLIANCE - The Secretary shall take effective measures to ensure that any licensee under this subchapter, as a condition of the license, complies with any limitation or prohibition imposed by any State or Indian tribe to which the licensee is subject under subsection (a) or (b), as the case may be. (3) VIOLATIONS - It shall be a violation of this subchapter for any licensee knowingly to accept bets or wagers initiated or otherwise made by persons located within any State or in the tribal lands of any Indian tribe for which a notice is in effect under subsection (a) or (b), as the case may be. No provision of this subchapter shall be construed as authorizing any licensee to operate an internet gambling facility that knowingly accepts bets or wagers on sporting events from persons located in the United States in violation of section 3702 of title 28, United States Code, except for fantasy or simulation sports games (as defined in section 5362 of this title). It shall be a complete defense against any prosecution or enforcement action under any Federal or State law against any person possessing a valid license under this subchapter that the activity is authorized under and has been carried out lawfully under the terms of this subchapter. Section 1084 of title 18 and subchapter IV of this chapter shall not apply to any internet bet or wager occurring pursuant to a license issued by the Secretary under this subchapter. (a) Electronic Cheating Devices Prohibited - No person initiating, receiving, or otherwise making a bet or wager with a licensee, or sending, receiving, or inviting information assisting with a bet or wager with a licensee, knowingly shall use, or assist another in the use of, an electronic, electrical, or mechanical device which is designed, constructed, or programmed specifically for use in obtaining an advantage in any game authorized under this subchapter, where such advantage is prohibited or otherwise violates the rules of play established by the licensee. (b) Additional Offense - No person initiating, receiving, or otherwise making a bet or wager with a licensee, or sending, receiving, or inviting information assisting with a bet or wager with a licensee, knowingly shall use or possess any cheating device with intent to cheat or defraud any licensee or other persons placing bets or wagers with such licensee. (c) Permanent Injunction - Upon conviction of a person for violation of this section, the court may enter a permanent injunction enjoining such person from initiating, receiving, or otherwise making bets or wagers or sending, receiving, or inviting information assisting in the placing of bets or wagers. (d) Criminal Penalty - Whoever violates subsection (a) or (b) of this section shall be fined under title 18 of the United States Code or imprisoned for not more than 5 years, or both. J) Administer the requirements of subchapter V of chapter 53. 5390. Cheating and other fraud. (a) In General - Before the end of the 1-year period beginning on the effective date of the regulations prescribed under section 4(a), and annually thereafter, the Secretary shall submit a report to the Congress on the licensing and regulation of Internet gambling operators. (a) Regulations - The Secretary of the Treasury shall prescribe such regulations as the Secretary may determine to be appropriate to implement subchapter V of chapter 53 of title 31, United States Code (as added by section 2(a) of this Act) and shall publish such regulations in final form in the Federal Register before the end of the 180-day period beginning on the date of the enactment of this Act. (b) Scope of Application - The amendment made by section 2(a) shall apply after the end of the 90-day period beginning on the date of the publication of the regulations in final form in accordance with subsection (a). Continue on to the bill.